Already own in La Serena? Thinking of selling? Click here and read about current search trends & our web network. 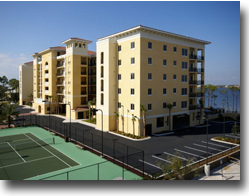 La Serena is located close to the Lost Key Golf Club in central Perdido Key, FL on Old River. Floor plans for La Serena condominium range from 1,800 square feet to over 4,000 square feet. Amenities for La Serena include a BBQ area, indoor heated pool, fishing pier, exercise room, outdoor river-front pool, spa / hot tub, steam room / sauna, tennis / racquetball area and assigned boat slips with deep water access and a short run to the Gulf of Mexico. Please let us know if you would like further info for La Serena or any other condos, homes or real estate along the Gulf Coast or would like to schedule a private viewing by emailing info@condoinvestment.com or by calling (251) Area-Pro (251-273-2776) for immediate assistance.